Admit it. Our obsession with weight loss often goes far beyond our fascination with delicious food. The rising trend of dieting proves that sacrificing even the most favorite meal is nothing to women when it comes to shedding off those excess pounds. And what if they are unable to commit to following a weight loss diet program? There are ‘hopes’ of a trimmer waistline being sold in bottles! Yes, the alluring idea of popping pills and losing weight is contributing to the ever-increasing popularity of ‘diet pills’. But such products with BIG claims have also created a great deal of suspicion and controversy. Do diet pills really work? Is there any truth to their claims? Are the pills safe to use? We unravel all the answers in this post. These pills keep you full and satiated for longer periods of time while suppressing appetite and driving hunger pangs away. They are usually rich in high soluble fiber content. Green tea extracts and psyllium are common ingredients used in such medications. Side Effects: They can cause bloating and gas in the abdomen. Laxatives claim to melt or flush out excess fat and toxins from your body, thereby helping you lose weight. What you need to remember is that they make you spend a lot of time in the toilet every day for the internal cleansing work they do. Some of the most common ingredients used in this category of diet pills are rhubarb powder and fennel powder. Side Effects: Taking such pills continuously makes the body dependent on them for bowel movements. Stimulants are made to ‘stimulate’ your metabolism and help you ‘burn’ the excess fat in a better and faster way. As they improve the metabolic rate of your system, the additional fat stored in your body gets converted into energy. The ingredients commonly used in such stimulants are caffeine and green tea extracts. Side Effects: They can induce hyperactivity in the body, shoot blood pressure levels up, and also increase the levels of acidity in the stomach. Fat blockers are taken along with every meal and they prevent your system from absorbing 1/4th of the total fat you are consuming through your food. They attach themselves to the enzyme ‘lipase’ that causes fat metabolism and helps you reduce your body weight. Side Effects: You may develop the risk of vitamin loss if you keep consuming such pills as fat-soluble vitamins like A and D need fats to get absorbed into the body. Who Can Take Diet Pills? Pregnant women should not take diet pills in any circumstances. Children and teenagers should also steer clear of these products. As mentioned before, diet pills offering rapid weight loss are highly controversial. The primary job of a diet pill is to work as a supplementary treatment for weight loss. It can help you get rid of those last few pounds of stubborn weight when you take it alongside a healthy diet and regular exercise. But if a product promises to help you lose 20 pounds of weight in a month without any diet or exercise, that is practically impossible. According to experts, only a modest amount of weight (5-10 pounds only) can be lost by taking even the most powerful diet pill. However, it does not appeal to the users in any way. There is a huge difference between unregulated diet pills and FDA-approved drugs. Most of the supplements available in the market are simply cashing in on people’s need to lose weight. They are launched untested and found ineffective. In fact, a number of so-called weight loss diet pills have been taken off the market for posing serious health risks. ‘Fen-Phen’, a combination of fenfluramine and phentermine, got removed from the market after causing damages in the heart, pulmonary hypertension, and even a few deaths. However, there are some FDA-approved weight loss medications which have been found to be somewhat effective and can only be taken after consulting with a physician. But your body may get tolerant to these after a continuous usage of 4-5 months and there may not be any significant result. Also, keep in touch with your doctor if you experience side effects, such as increased blood pressure, irregular heart rhythms, palpitations, headache, allergic reactions, mood swings, etc. 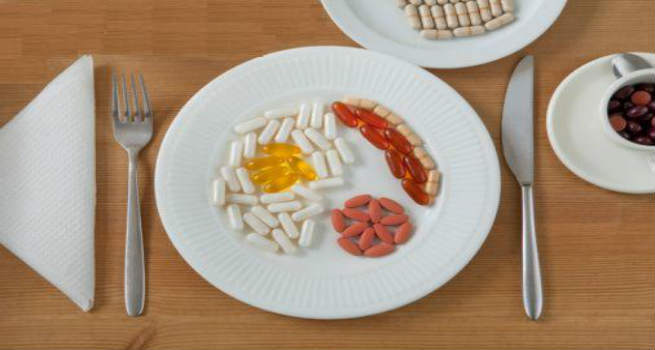 FDA-regulated diet pills do not work for everyone. They are also not risk-free. But their modest benefits can offset the the health risks caused by your excess body weight at times. Clearly, over-the-counter diet pills are NOT the answer. Instead, the tried and tested formula of eating a healthy and well-balanced diet (in moderate portions), staying off junk food, and exercising regularly is the formula to lose weight. In addition, try behavioral therapy to understand and rectify your attitude about consuming food. Also, there are no quick fixes for weight loss. When you have developed a healthy exercise regimen, have undergone a substantial weight loss and are starting to hit a plateau, only then you can think of getting a prescription from your doctor for the diet pills to give your efforts a secondary push. It will help you remain motivated through your weight loss journey.